SCARY HORROR STUFF: I Know I Don't Mind Remakes, But LITTLE SHOP OF HORRORS? REALLY? 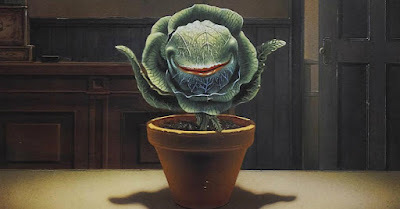 I Know I Don't Mind Remakes, But LITTLE SHOP OF HORRORS? REALLY? I'm of the crowd flexible enough to give a remake a shot, honestly. In fact, many remakes revitalize the classics in ways you never thought possible -- THE LORD OF THE RINGS, KING KONG, GODZILLA, CINDERELLA. Hell, even classics like DRACULA and THE MUMMY benefited from the remake, or reboot, what have you. Case in point: THE ROCKY HORROR PICTURE SHOW. Good remake. Just as good as the original? Probably not. It comes down to the why -- why is someone even considering remaking a classic? Is it to try and honor the original? A celebration of the original? Perhaps reinvent and modernize? Or is it to just 'cash in' on the classic name? If it's the latter, guess what: viewers can sense that. And I'm beginning to wonder if this remake coming up of LITTLE SHOP OF HORRORS will fit into that 'cash in' mentality. You just can't replicate or reinvent LITTLE SHOP OF HORRORS! It's simply impossible. Call me crazy, but when I heard that the remake was being made of this classic horror musical, I freaked a little. I might be wrong: and it might do it justice. Heck, it might open up new themes for the viewer loving Audrey II. Remaining faithful, and trying something new -- that balancing act involves a very, very, very, very thin wire. Let's hope the director, the screenplay, and the actors stay on that wire.